For thousands of years in Range, a million souls have been reincarnated over and over, keeping their memories and experiences from previous lifetimes. When Ana was born, another soul vanished, and no one knows why. Even Ana's own mother thinks she's a nosoul, an omen of worse things to come, and has kept her away from society. To escape her seclusion and learn whether she'll be reincarnated, Ana travels to the city of Heart, but its citizens are afraid of what her presence means. When dragons and sylph attack the city, is Ana to blame? I remember being incredibly nervous about reading Incarnate because of all the hype that had built up around it. But my worrying was incredibly uncalled for - I absolutely LOVED this debut novel. It definitely earns a spot as one of my favorite reads of 2012 so far! While reading Incarnate, I found that I totally felt for Ana. It would be very difficult to live in a world where everyone has an immediate reaction or even prejudice against you simply because you were born. It is made fairly clear that Ana grew up feeling out of place, shunned and like she didn't even deserve to feel, enjoy or simply live. It hurt my heart because here was this intelligent, lovely and completely determined girl, who no one acknowledges (and she lives with a terrible parent, by the way). One of the best parts of the novel is watching Ana's transformation as she learns that what she feels should be respected, what she wants is valid and that she too places a role in the society, though it's still unclear what that role might be. As for Sam, well, I LOVED him from the very first time he appears in the novel. How could you not love someone who is incredibly charming, intelligent, artistically inclined, noble and who manages to immediately accept Ana? I love how he never once treated her like she didn't belong or that she wasn't a valid person because of her circumstances of birth. His kindness, affection and the time and effort he spent on Ana, his demonstration of his respect for her wants, opinions and needs - those were all lovely to read about. Watching as he comes to really care for her is simply heartwarming. But more on that later. This novel completely intrigued me from start to finish. I was never certain of what would happen next, and my curiosity was what had me flipping the pages as quickly as I could! It was always exciting to find out more about Ana and about Heart. I thought there was a great pace to the book, cleverly weaving together the quieter, sweeter moments with the intense, action-packed scenes. I was totally enthralled as well by the combination of futuristic technology with the presence of creatures like sylph and dragons. Though it was definitely a clash between the stuff of science fiction and the paranormal creatures, I thought it was well done. After all, we don’t know anything about Heart that we don’t learn through Ana’s experience - I personally feel like anything could happen in that place. The romance was lovely. It moved so, so slow that I was just (mentally) yelling at Sam to get a move on for a lot of the scenes between him and Ana. But the build-up and the end result just more than totally made sense and I now think it wouldn’t have worked any other way. A quick aside before I give my recommendation - one of my favorite parts of the novel is the masquerade. It was definitely a big event, both in the city and in the novel as a whole, and I loved everything about it - from the descriptions of the festivities and costumes to what went down. ... definitely read this fantastic debut YA novel! It's got an incredible and quite unique story, as well as elements of romance, paranormal and science fiction. Jodi Meadows did a wonderful job and I cannot wait for the next book in the series! Lovely review Alexa I'm glad you enjoyed this one too! I also felt really sad for Ana it was such a lonely feeling. And the world is really imaginative for sure. Ha! I agree about the romance moving kind of slow. I really enjoyed this book! Adding to my To Read list. Great review! I think this will be one of my next reads. 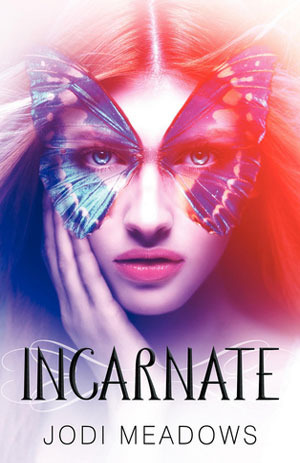 I still have an eGalley of this on my Kindle, but I'm sure that I'll like this (it seems as though there are almost NO negative reviews about INCARNATE) and then I'll get a pretty copy for my shelf as well. Awesome review Alexa! I just bought the e-book of Incarnate and I can't wait to read it. Your review makes me want to read it even more (: Thanks for the great review. Sam sounds amazing and I LOVE the idea of a masquerade!! :) And the combination of sci-fi and paranormal sounds very interesting! Excellent Review! I have been looking forward to reading this one ever since it’s release. I really need to stop putting it off and just read it cause I know it’s going to be good! I was so excited when I saw what book you were reviewing. LOVED IT!!! Ana & Sam are pure perfection. Your review is pure honey. Beautifully done. You captured Ana's situation & I wanted to just smash their faces together. But you are right Jodi knew what she was doing with the pace. This one is coming up VERY soon on the ol' TBR pile. It only makes me more excited to read it when you say that it's awesome. And I keep hearing about how great the masquerade scene is! I'm going to be waiting for it the minute I start reading! Fab review, my dear! Great review, Alexa! I'm glad you ended up loving it. I totally understand how you were initially nervous to dive in, so I'm glad it didn't let you down. The world in this book is so rich and Ana and Sam were both lovely. I'm excited to read the next book! I was just thinking about that the other day - it must feel really awful to be the only one of your kind. I felt so bad about her being ostracized just because she had been born. But Sam more than makes up for it! Ooh, you should bump it up! I really loved it. I was afraid I wouldn't - but once I started reading, well, it was clear it lived up to the hype for me! I definitely recommend it. It's one of my five-star reads for 2012! Oh, this is totally going onto my list of top reads for 2012. It was just SO good. And Sam is definitely a worthy contender for a favorite love interest - yay for the good guys! I already said this on Twitter but I <3 you! I can't believe you would go and do that for me and I am SO excited to get this in the mail!! You must! I certainly feel like you would enjoy it :) I've personally stopped requesting books on NetGalley, buying books or borrowing them from the library. It's my effort to make my review and TBR pile grow smaller haha. Read it! I definitely recommend this novel. It's just such a lovely story. And you must meet Sam! The masquerade part is one of the best parts. Seriously. I hope you read it soon! I haven't read this one yet *sigh* Another book everyone loves that I haven't read, lol. Yay masquerade! I keep reaching for this book at B&N, and then hesitating because I'm not sure if it's my thing... You review was really lovely and gave me enough positive reasons to pick it up. I especially like that you say the romance moves slowly and builds. No insta-love! And the fact that she blends science fiction with sylph and dragons sounds fantastic! I especially want to support debut authors, so the next time I'm in B&N, I definitely won't hesitate! This book is incredible. I'm probably going to reread it this year and I only wish I could experience it for the first time all over again! I hope you get to read it! The masquerade scene is completely delightful! I hope you love this one! It really is one amazing debut, and I hope you got the opportunity to read it!